Welcome to the Office of the President! The Office of the President oversees administration as they execute the day-to-day operation of the College, by delegated authority of the Board of Trustees. As the college’s Chief Executive Officer, the President along with her leadership team has always embraced education. We pride ourselves on playing an intricate role in transforming lives through education and serving as the champion for innovative teaching techniques. 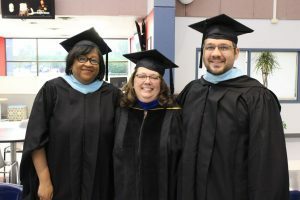 Whether you are finishing high school, or a working adult returning to school, we promise you that South Suburban College is the place for you! We offer seven types of associate degrees and more than 70 occupational certificates. In the non-credit programs, the college offers an adult education program for those who are interested in taking the high school equivalency exam and a Continuing Education Department that offers special interest courses such as Beginning Yoga, Music and Art Appreciation, and Welding to name a few. The invitation to register for classes has officially been extended, the choice to accept the offer is yours. The Office of the President extends a personal invitation for you to consider enrolling at South Suburban College. With knowledge comes power, and with power comes the ability to positively impact your life and the life of people you know as well as strangers. Let the power of earning a quality education begin at South Suburban College! We wish you the best educational experience from start to degree or certificate completion at South Suburban College ! Provide clear and concise understanding and interpretation of the purposes and goals of the comprehensive two-year college in the State of Illinois to the Board, public and College staff. Represents the Institution to its many publics, and is responsible for public understanding of the institution and its programs. Engage in a transparent communication flow that ensures that faculty views, including dissenting views, are presented to the Board in areas and on issues of mutual concern. Create a culture of inclusivity and increased awareness by informing faculty and staff of the views of the Board and the administration on the various issues, which from time to time confront the College. Strengthen communication and employee relations between the Board and all College personnel. Apply fiscally sound management practices to assure the maintenance of existing institutional resources and the creation of new resources. The American Association of Hispanics in Higher Education (AAHHE) addresses issues and concerns affecting Hispanics, with a focus on Higher Education. AAHHE is committed to addressing societal issues as they pertain to the growing Hispanic population, convening public forums to develop public policy reflecting the changing demographics of our nation, and preparing more Hispanics to pursue a career in higher education as faculty, administrators, and policy makers. The Calumet Area Industrial Commission (CAIC) supports programs directed toward industrial retention and expansion in the City of Chicago, southern Cook County, and northwestern Indiana. CAIC has a variety of workforce development programs to address the industry’s need for manufacturing talent and training. CAIC offers consulting services in areas related to safety, OSHA, environmental control and economic development. The Calumet City Chamber of Commerce helps to promote local businesses by offering opportunities to develop a connection in the community. The Chicago Southland Chamber of Commerce provides regional leadership, advocacy, and strategic alliances and programs that unite and grow its members and the business community. The Illinois Community College Trustees Association (ICCTA) provides legislative advocacy and educational opportunities for college boards. The Illinois Council of Community College Presidents is an organization consisting of all chancellors and presidents of the public community colleges in Illinois. The Council meets periodically throughout the year to discuss common problems of concern and issues in community college education. It works closely with the Illinois Community College Trustees Association. Junior Achievement of Chicago is dedicated to giving young people the knowledge and skills they need to own their economic success, plan for their futures, and make smart academic and economic choices. JA’s programs in the core content areas of work readiness, entrepreneurship and financial literacy ignite the spark in young people to experience and realize the opportunities and realities of work and life in the 21st century. The Lansing Area Chamber of Commerce strives to help local enterprises flourish, provide valuable services and enhance the community with various events and promotions. The chamber helps to bring customers to the community, and keeps members informed of networking opportunities. The Oak Forest-Crestwood Area Chamber of Commerce helps to drive the success of businesses in the southwest suburbs. The South Holland Business Association (SHBA) provides networking opportunities to local businesses through monthly luncheon meetings, business-after-hours, and other annual events. Members also have access to educational and informational channels on a wide variety of business topics designed to meet the needs of local businesses. The South Metropolitan Higher Education Consortium fosters new and enhanced educational services and programs to citizens, businesses and other institutions in the Chicago metropolitan southland region. Through institutional collaboration, the Consortium focuses on programs that promote college readiness, support college completion, enhance educations opportunities and identify economies and efficiencies that result in streamlining and cost savings. The South Suburban Mayors and Managers Association (SSMMA) works to facilitate cooperative efforts in municipal management, planning, public safety and infrastructure, economic development, and community relations in southern Cook and eastern Will Counties. The South Suburban Small Business Association (SSSBA) is a non-profit regional organization dedicated to the concerns and issues affecting small and minority businesses in the seventy-nine communities within an area approximately bounded by Evergreen Park to the north, Gary Indiana to the east, Peotone to the south, and Joliet to the west. The SSSBA provides members with educations programs in business management, human resources, office training and marketing, and maintains political awareness on the local, state and national levels for the issues that impact the members’ community. The Southland Ministerial Health Network (SMHN) strives to realize the World Health Organization’s (W.H.O.) definition of health for the south suburban communities of Chicago, and to raise the voice of faith-filled justice for communities and congregations. The Tinley Park Chamber of Commerce encourages growth and prosperity of local businesses by offering customer referrals, conference room rental, and member discounts. For more information on the Office of the President, please contact Christin Miller at 708-596-2000 ext. 2200.